PLEASE NOTE: The Baader T-2 90-deg Prism Diagonal (with Baader 32mm Prism) consists of a diagonal body with prism only. It is provided as a basic component, without any nosepiece or eyepiece holder. It incorporates standard T-2 threads at the input (female T thread on the telescope side) and output (male T thread on the eyepiece side) faces. This permits the diagonal to be used as a compatible component along with the other Baader Planetarium T-2 adapters and accessories. Baader Planetarium has just expanded their innovation in star diagonals. Now, the mid-size, flexibility, and cost of the T-2 Prism Diagonal make this the ultimate diagonal for high power planetary viewing, or in systems where back-focus or space is limited and a full aperture 2" diagonal will not work or is not flexible enough. One of the key features of T-2 diagonals - be it prisms or mirrors - is the large free aperture and the flexibillity to directly adapt onto almost any telescope system, without the bottleneck of a 1.25" barrel size which may cause vignetting in long focal length 1.25" eyepieces or when working with a binoviewer on top of the diagonal. That is precisely why Baader offers the body of all their T-2 System diagonals without adapters. The Baader Planetarium T-2 Prism Star Diagonal features a high quality Baader prism with a clear aperture of 32mm / 1.26". Like all the Baader Planetarium products, the mechanical quality and finish are superb. The precision machined aluminum housing provides a stress-free mounting and precise location for the prism, unlike the typical weak plastic or crudely cast housings found on lesser diagonals. Extremely low scatter and high contrast images are the hallmark of this prism diagonal. Modular T-2 System Design: The design of the T-2 Prism Diagonal enables it to be configured to exactly suit your needs. The input and output T-2 threads integrate with the full range of Baader Astro T-2 System components and other T threaded adapters. The telescope side can hence be configured to fit in 2" or 1.25" focusers, as well as directly on telescopes with specific threads such as original M44 Zeiss threads, Vixen OTAs or Russian Maks. The eyepiece side can be used with Baader's quick change ring #6 in order to mount the Mark V binocular viewer instead of an eyepiece (in order to achieve the shortest possible backfocus distance between telescope and binocular viewer) or alternatively mount 1.25" (not 2") eyepiece holders. It is also the perfect diagonal for use with the Baader / Zeiss Giant Binoviewer (replaces the normal prism diagonal) as well as the Baader Maxbright Binoviewer. Not just a visual accessory, this diagonal also integrates well into digital imaging applications. 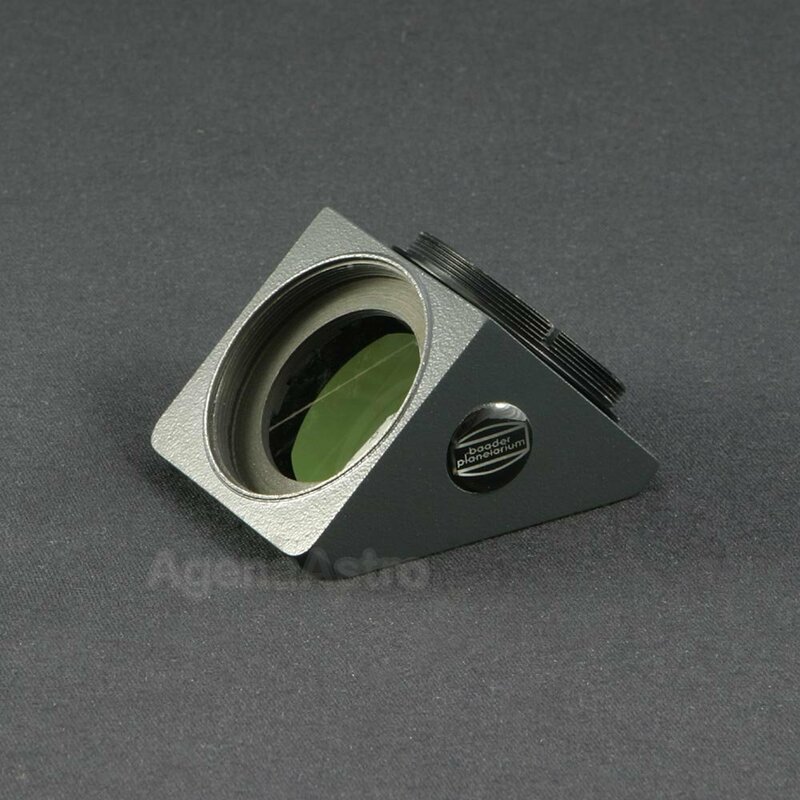 The effective optical path length of the base T-2 Prism Diagonal is 37mm. 5.0 (Based on 6 Reviews) 100% of reviewers recommended this product. Using this diagonal to shorten the light path for my binoviewer. Back focus was always a problem but now I can achieve focus on both my st80 and st120 without shortening the tube. Add in a 2” T2 nosepiece and a custom T2 binoviewer adapter and you’re all set! I purchased this to help reduce focal length for my C8 when using binoviewers. I am using it with the Baader 15mm SCT to T2 adapter and a T2 adapter that screws in to my binoviewer. Works like a charm. Views have improved and the connections are rock solid. Using this to replace stock Celestron diagonal. I am really impressed with Baader Planetarium! Review by Bravnov of Baltimore, Maryland. This diagonal has male t-thread on one side and female t-thread on the other. If you are looking at this product, I suspect you are assembling an imaging train that avoids the weaknesses of 1.25 and 2 inch eyepiece stock held on with set screws. This item does the job nicely and lets you thread a diagonal onto your scope and thread on other components. I use this diagonal as part of a fisheye mode planetarium projector. I was able to connect M42 threaded camera lenses (common on older SLR cameras) using adapters. I was worried that the prism in this piece might not provide sufficient resolution for full HD projection but it does a nice job. I think astronomers will be happy with it as well. Review by saguaro of Tucson, AZ. This is one mighty little diagonal! Optically it is excellent and also very strongly constructed. It holds a heavy binoviewer with ease. Provides a short light path which is desirable when used with a binoviewer. Review by desertlens of NM. I've acquired two of these for applications which needed the shortest possible image path: a filter wheel and a 6" SCT. In both cases, the 37mm path of the Baader prism easily met my needs. Construction and optics are very well executed. The generous inventory of T-thread components maintained by Agena made both setups easy to accomplish. I couldn't be more pleased.